You do not have to be concerned about overeating one more day. Do you feel stress about getting everything done this time of year? Do you worry about having Christmas goodies around, because you know you will overeat? Do you feel guilty about overeating this time of year? Do you spend more time on everyone else than you do for yourself? I am Kim McLaughlin and I assist people who overeat and help them have peace with food. I am here to tell you that you can go through Christmas without worrying about the food, your weight AND not feel stressed. You do not have to worry about overeating this holiday. I have designed a program that will help you navigate the holiday and all the stress and goodies that show up this time of year. Many people tell me they have a problem with Christmas food, parties and gatherings. I know there is a better way to handle food which does not include giving in and overeating looking to go on the next diet come New Years. I will give you the techniques I teach my clients about how to approach food as well as how to approach life around this holiday season. My program does not involve calorie counting, weighing and measuring nor does it include saying no to certain foods. This Challenge will be from Wednesday December 12- Wednesday December 19, 2018. Daily short videos where I present to you very doable behaviors for the day as well as inspiration and encouragement. These videos are short (about 10 minutes) and can easily fit into your busy schedule. 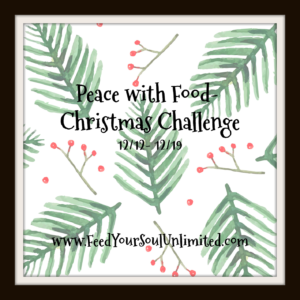 Daily Facebook encouragement (from me and other participants) on our private Peace with Food- Christmas Challenge Facebook page. I will answer questions you send me on Facebook Live, don’t worry if you cannot attend live, the videos are available anytime after the recording. This is a lot to offer for such a low price, because I want you to have peace with food this Christmas and not struggle. You want to get in on this now! The Christmas Season is here and all the stress that goes with it. 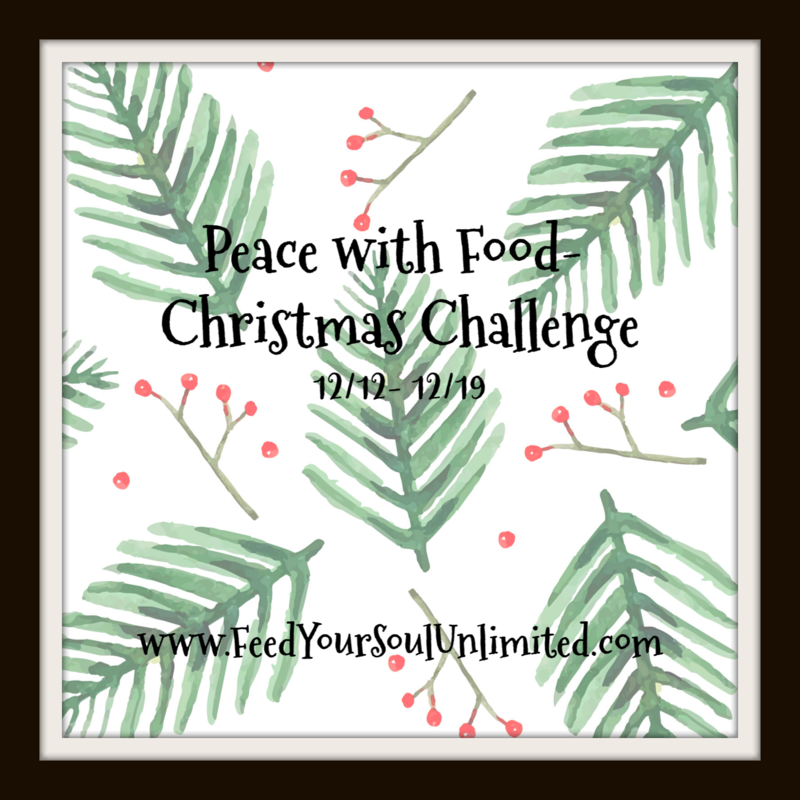 The techniques I will teach you in this Peace with Food- Christmas Challenge will ground you and give you more inner peace with yourself, peace with others and peace with food. Sign up now to get in. You do not want to miss this opportunity to handle Christmas Season differently for ONLY $20.